Most teens dream of visiting the City of Light, but it feels more like a nightmare for Sophie Brooks. She and her brother are sent to Paris to spend the summer with their father, who left home a year ago without any explanation. As if his sudden abandonment weren’t betrayal enough, he’s about to remarry, and they’re expected to play nice with his soon-to-be wife and stepdaughter. The stepdaughter, Camille, agrees to show them around the city, but she makes it clear that she will do everything in her power to make Sophie miserable. Sophie could deal with all the pain and humiliation if only she could practice piano. Her dream is to become a pianist, and she was supposed to spend the summer preparing for a scholarship competition. Even though her father moved to Paris to pursue his own dream, he clearly doesn’t support hers. His promise to provide her with a piano goes unfulfilled. Still, no one is immune to Paris’s charm. After a few encounters with a gorgeous French boy, Sophie finds herself warming to the city, particularly when she discovers that he can help her practice piano. There’s just one hitch—he’s a friend of Camille’s, and Camille hates Sophie. While the summer Sophie dreaded promises to become best summer of her life, one person could ruin it all. One of my favorite contemporary romances is Anna and the French Kiss. I loved reading about Paris, and I was excited to find out about One Paris Summer. 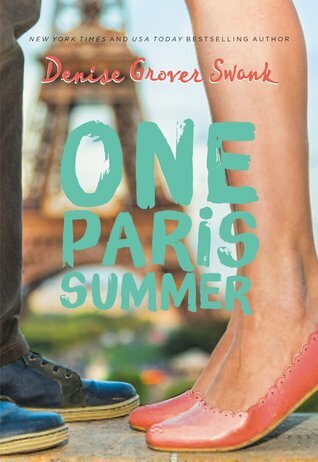 One Paris Summer was such a fun and enjoyable read. I was able to visit Paris last summer and I loved that I was able to recognize and picture all of the places Denise Grover Swank wrote about. Last year, Sophie’s father left her family to pursue his dream job in Paris. Still hurting from his betrayal, Sophie is upset about seeing him again and being forced to spend the summer with him and his new wife and stepdaughter. To make matters worse, Sophie’s new stepsister is out to make Sophie miserable. Sophie’s one sanctuary from all this is the piano. After her dad left, Sophie poured her heart and soul into her music and has become a talented pianist because of it. She needs to practice daily in order to to be ready for a scholarship competition when she returns home, but her dad wants her to focus on enjoying her time and going out to see the city while she’s here. At the beginning, Sophie is afraid of a lot of aspects of the city. She’s afraid of being left on the metro, getting lost in the city, not understanding the language, and plenty more. Throughout the novel, we see Sophie become more confident in herself and her abilities. She starts learning French and understanding the metro system as well as how to get around in the city. By the end, Sophie’s conquered many of her fears and has changed for the better from her time if Paris. A main focus throughout the book was on family. Sophie and her older brother Eric are not close at the start of the novel. Throughout their time spent together, they form a closer sibling relationship and become protective of each other. They both were hurt by their father’s leaving and I loved how they stood by each other while having to confront him over the summer. Their dad is truly sorry and wants to repair his relationship with his children, and I liked how they all went through many obstacles in order to come to an okay place. Another relationship I enjoyed was the one Sophie formed with her stepmother, Eva. I loved how sweet and kind Eva was and how hard she tried to make her apartment feel like a home for Sophie. Watching their relationship develop was one of my favorite parts of the story. On the other hand, Eva’s daughter, Camille, I absolutely hated. Camille despised Sophie from the start and went out of her way to make Sophie’s life miserable. The romance was sweet. Sophie meets a cute boy outside of Sophie’s dad’s wedding reception. Before even being able to exchange names, he has to run off to meet a friend. After being left in the metro by herself, Sophie runs into the boy again only to find out that he’s Camille’s friend and was sent to find her. Feeling set up, Sophie’s mad at both Camille and Mathieu. However, while picking something up from Eva at the apartment, Mathieu overhears Sophie playing on a keyboard and offers to let her practice on his mother’s piano. Every morning, Sophie meets up with Mathieu, has breakfast with him, and then walks to his apartment to practice for two hours before meeting up with Eric, Camille, and her friends to tour the city. I loved watching Sophie and Mathieu’s relationship formed and I found it to be endearing. Overall, One Paris Summer is a cute summer romance and a sweet coming of age story. I recommend it for fans of Stephanie Perkins’ Anna and the French Kiss!